This is sort of a reverse fondue; warm Bacon dipped into chilled, soft coffee ice cream.It is so good, it's what I had for dinner! I could not stop eating it. The coffee, the crisp lacquered (billion dollar word!) 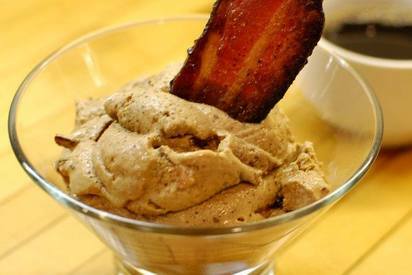 Bacon morsels, the creamy-crunchy ground coffee combination, soft ice cream—I didn't even sit down! A truly heavenly combination. Happy National Soft Ice Cream Day!